The year was 1510 and Katherine of Aragon, Queen of England was pregnant. As the months passed, her pregnancy was progressing and it was almost time for her to retire to the birthing chamber for her lying-in as custom required. In November, a great tournament was held where her husband, King Henry VIII outshone all other participants. The court then slowly made their way to Richmond Palace. Before she left society, a series of entertainments were staged for her by Henry. He was determined to impress Katherine and certain representatives from the courts of Katherine’s father Ferdinand of Aragon and her nephew the future Holy Roman Emperor Charles V.
In one of these presentations, Henry and fifteen gentlemen pranced in front of Katherine and the audience in fanciful costumes. They wore jackets of purple and crimson with white velvet bonnets draped in gold damask, capped with white plumes. After dancing they exited and musicians came in with six gentlemen wearing yellow satin and carrying torches. Then six more men arrived masked and dressed in extravagant clothes and bonnets of cloth of silver. Everyone tried to pretend they didn’t know who the tallest gentleman was. Ladies arrived arrayed in crimson satin embroidered with pomegranates made of cloth of gold and they danced with the gentlemen. As the dance ended, the ladies removed the men’s masks so they could be identified. All those in attendance praised the king much to his delight. Just before Christmas, Katherine heard mass and then hosted a banquet for the men and women of the court in her great chamber. Wine and spices were served and then two high-ranking lords accompanied Katherine to the door of her bedchamber. She took her formal leave of her officers and male courtiers. She then retired inside and wouldn’t be seen again until her child had been born. No men, not even the king, were allowed in the chamber from that point on. All necessary items were delivered outside the door and taken in by the ladies. The room was darkened and hung with tapestries depicting images of romance. There were no representations of gloomy or scary images that might frighten the mother or the child. The font from Canterbury was placed in the chamber in the event the child was in distress and needed to be baptized in haste. To everyone’s joy and delight a healthy baby boy was born on New Year’s Day, 1511. Henry was greatly relieved and ordered bonfires to be lit in the streets of London and instructed the Lord Mayor to organize for the citizens to be served free wine to drink to the health of the Prince. The cannon along Tower Wharf fired a royal salute. The midwife received a large cash reward. 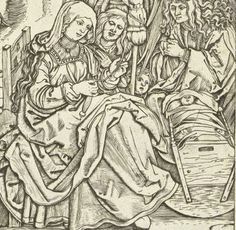 Katherine sat back to watch as her ladies washed and swaddled the child and put him in his tremendous cradle. It was five feet by two feet and made of painted wood with silver gilt and buckles on either side to secure the swaddling bands. When Katherine was well enough to sit up, her bed was moved to the presence chamber where, dressed in a crimson mantle, she received guests. Custom required the new mother remain in the lying-in chamber for thirty to forty days. She would then take part in a purification ceremony called “churching” after which she could return to normal activities. Five days after his birth, the Prince was carried by his nurse to the Church of the Observant Friars next to Richmond Palace. The baptism was witnessed by major courtiers and the ambassadors from France, Spain, Venice and the pope. The child was named Henry after his father and grandfather and was styled Duke of Cornwall. He had distinguished godparents: the Archbishop of Canterbury William Warham, the Earl of Surrey and his great-aunt and uncle, the Earl and Countess of Devon. His sponsors were King Louis XII of France and Margaret of Austria, Duchess of Savoy, the daughter of Holy Roman Emperor Maximilian I. Louis and Margaret sent expensive gifts of gold plate. After the baptism the ambassadors visited Katherine in her privy chamber to congratulate her. Once Katherine had been purified in the churching ceremony, she and Henry went to Westminster Palace, leaving the young prince in his nursery at Richmond. His parents would have visited him but every detail of his daily regimen was overseen by his mistress who supervised the wet nurse, the dry nurse, four rockers and others. Henry took advantage of the opportunity of the birth of the prince to celebrate by presenting tremendous entertainments in his honor. On February 1, he gathered together three of his comrades, all dressed in coats of green satin trimmed in crimson velvet. He issued a challenge for anyone to try their luck against him and his men and they tilted against four other courtiers. On February 12, perhaps the largest and most fabulous tournament of Henry’s reign was staged. Katherine and her ladies sat in state inside an enclosure lined with cloth of gold and purple velvet, all embroidered with H’s and K’s, pomegranates and roses. As she watched, a large pageant cart appeared in the tiltyard that looked like a magical forest with flowers, herbs and trees. In the center was a huge golden castle. The entire cart was pulled by two “animals”; a lion covered in gold damask and an antelope with gold horns, covered in silver damask. As everyone regarded the pageant cart with awe, the sides suddenly fell open. Trumpets sounded while Henry and his band of men rode out on chargers draped in gold. The pageant was dominated by jousts with the king and his men riding into the lists under canopies of cloth of gold and purple velvet with the letters of H and K embroidered in gold. Henry’s canopy was topped with a golden imperial crown. They ran course after course and Katherine bestowed the prizes on the winners. Henry received the challenger’s prize to great applause. The next night there was great revelry at Whitehall with more pageants, dancing and elaborate garb. This was followed by a banquet in the presence chamber attended by the entire court. Dreadful news came to the new parents ten days later. Prince Henry had died after only fifty-two days. There is no consensus on the cause of death. He may have taken ill as many children did then. Or possibly he died of sudden infant death syndrome. Whatever the cause it was a terrible tragedy for the king’s dynasty. Katherine was distraught and Henry did the best he could to comfort her. The last rite to be completed was the burial of the poor child with all the honors due a prince. Etiquette determined that the King and Queen not attend the funeral in person so they relied on trusted courtiers to perform the ceremony. Arrangements were made to bury the Prince in Westminster Abbey. The tiny coffin was carried from Richmond Palace down to the Thames where three barges draped in black took it up the river. All those involved in the ceremony were dressed in black. They included the official mourners, those who carried the coffin, six knights who carried religious and regal banners, several servants, and one hundred eighty paupers who were paid to pray for the soul of the child. Along the route were lighted wax candles and prayers were sung and chanted as the entourage made its way to the Abbey. The monks received the remains of the little boy. The choir was draped in black and with all solemnity, the coffin was lowered into the grave. He was buried on the north side of the Sanctuary area near the entrance to the chapel of St Edward the Confessor who founded the Abbey.